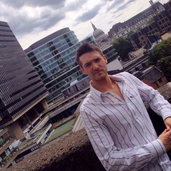 About me Private investor in London. Mainly looking at the FTSE but will follow forex tips from hotforex because those guys have high win rate. weakening pound. Festive optimism and increased spending! A big move down at open made trading the break out of the opening 5min bar a tricky one. The opening 1h bar has not broken either. We've had a bit of movement already in the FTSE. Down because of NK and further selling at open. Up again after hitting support (not other reason to be seen).47 5min opening bar break up worked though risky. We have not broken the opening 1h bar yet. Other trackers are mixed. The trackers are consistently down .25% and the ftse fell overnight too stopping me out. I went short at 8am but the 5min opening bar of 15points broke up and is still hovering at that level. The 1h opening bar is broken upwards but I don't think that it has momentum. The 5min opening bar break up got stopped out. I'm still long anticipating the breaking of the 1h opening bar to the upside. The other trackers are mostly down a little bit but we have a bit of a climb ahead after NK and Parsons Green. I've been away on business but now back in London so let's get started! I've been able to make some money on my zulutrade account by following boi prod. Opening 5min bar break down failed Opening 1h bar is trying to break upwards. Hesitant to enter with trend because of mixed sentiment in the other trackers. We just had a bit of a move down so I am now long trusting in the support of 7400 and looking that the other trackers which are up. 5min opening bar break didn't quite work. 1h opening bar also failed. I don't think it was the CPI data that caused the drop. Bit late today - on business in India. All the trackers are up. Not sure what weekend news made the FTSE jump yet. I'm finding it difficult to go long or short today because of no reason to do either apart from: The 5min opening bar broke up and is trending and still active. The 1h opening bar broke up and is trending and still active. I was thinking long this morning but looking at the other indices, I've adjusted to a non moving plan today. We still haven't really broken the opening 5min bar let alone the 1h bar. All the trackers bar the Nikkei are up today but I'm trade the prevailing negative news stories in anticipation of more negative back and forth with Korea and with the equatorial weather in the west. buying the 5min bar break would have made 12 points. We have not broken the 1h bar yet. Not much inspiration for today. My head hurts - gym injury. That's all I know. I thought the FTSE did well to break 4000. I wasn't looking at the time but would have been buying the dips. I'm short but it could easily break 4500 so looking for another dip. 5min bar break expired at a loss. 1h bar is not broken. Trackers are up across the board 5min bar break down failed 7points. 1h bar break up is a cert for a measly 12 points.